The purpose of this article is to introduce Managed COBOL syntax. It's a big subject, so this is just the tip of the iceberg. We can add more detailed articles on specific areas in future - if you have any suggestions of areas you'd like to see, please let us know. What’s the difference between .NET COBOL & JVM COBOL? Managed COBOL is COBOL with extensions to support the .NET & JVM frameworks. This includes OO syntax support and syntax to allow access to the available class libraries. You could view “Managed COBOL” as a new COBOL dialect. Our aim is for .NET COBOL & JVM COBOL to be syntactically identical. They’re not exactly the same yet, partly because .NET COBOL is more mature than JVM COBOL, so we’re playing catch-up. This aim offers us some challenges. What if there are differences between the frameworks which mean our behaviour would differ from existing languages in that framework? Should .NET COBOL behave like C# & JVM COBOL behave like Java? Or should .NET COBOL behave like JVM COBOL? This is a tricky one, but we’re going to stick with that aim of trying our best to make COBOL behave the same on both platforms. But actually... although this might offer us some technical challenges, it could also offer great advantages to the Managed COBOL language because it could potentially get the best of both worlds (JVM world and .NET world) - if we implement .NET framework syntax in .NET COBOL we will also implement that syntax in JVM COBOL (unless there’s a good reason not to) even if it does not already exist in the JVM framework and vice versa. This is a JVM syntax that does not exist in the .NET framework. We’ve added the SYNC keyword on methods for JVM COBOL and for consistency it is also supported in .NET COBOL. This does not exist in other C# or VB. This is a new language feature in Visual COBOL R4. This is a .NET feature that does not exist in the JVM. But because of our .NET COBOL & JVM COBOL parity aim, when extension method syntax was added to .NET COBOL it was also added to JVM COBOL. 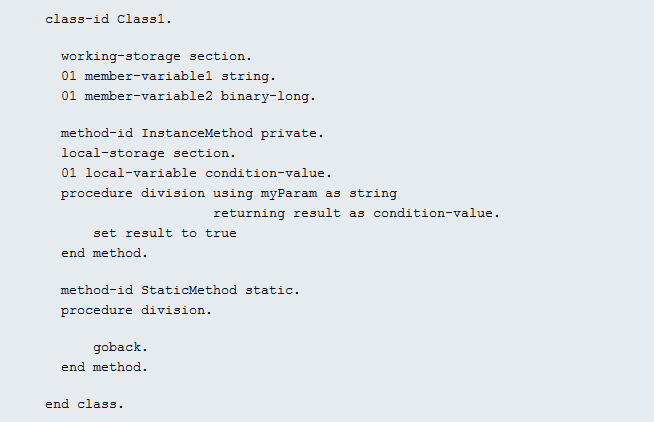 So extension method syntax is available in JVM COBOL, although not in other JVM languages. So .NET COBOL users get SYNC on method syntax and JVM COBOL users get extension method syntax - syntax that does not exist in other languages in that framework. Managed COBOL includes OO syntax and also syntax that allows us to access the framework’s class library. Let’s have a brief look at those two areas. Managed COBOL provides support for classes, methods, inheritance, access levels (public, private) etc. Accessing the class library is fundamental to a managed language. The Managed COBOL syntax to allow you to do this are the invoke and set verbs. In the set example, you can see that the COBOL syntax is the same in .NET COBOL & JVM COBOL. Where the program differs is the names of the namespaces/packages and classes available in your environment. In .NET, string maps to the System.String class in the .NET class library. Length is a property of System.String which returns the length of the string. In JVM, string maps to String class in the java.lang package. length() is a method of the java.lang.String which returns the length of the string. Predefined types have been used in the examples above, so worth a mention. These are new types that have been added to the COBOL syntax that map to managed framework types. Since “.NET COBOL” and “JVM COBOL” syntax are the same, we call the language “Managed COBOL” unless the syntax differs. The SYNC keyword is the equivalent of LOCK in C#. It ensures that one thread does not enter a critical section of code while another thread is in the critical section. If another thread tries to enter SYNCed code, it will wait, block, until the object is released. You can a SYNC block around a block of code and from R4 you can also SYNC a method. Extension methods enable you to "add" methods to existing types without creating a new derived type, recompiling, or otherwise modifying the original type. Extension methods are a special kind of static method, but they are called as if they were instance methods on the extended type. For Managed COBOL client code, there is no apparent difference between calling an extension method and the methods that are actually defined in a type. What happens if my class is a partial class or is said to be an "internal" class, is this something that is portable to the JVM world?